Instead of spending your year-end bonus on your next holiday or a big-ticket purchase, consider making the extra cash work for you. Workers in the private sector could get bonuses of between two and 31/2 months, including a 13th-month bonus, The Straits Times reported recently, while the total bonus for the public sector is 2.5 months. The best thing to do with any extra cash is to reduce expensive debt. "Expensive debt is typically characterised by its high cost of financing, such as credit card debt, which incurs a typical annual interest charge of 24 per cent per annum," says Mr Albert Lam, managing director, investment and research, at IPP Financial Advisers. "Any bonuses received should first be used to pay down such debt." Financial experts say the next priority is to build up a cash buffer of three to six months of personal or household expenses. Mr Brandon Lam, head of consumer investment and insurance products at DBS Bank, suggests using your bonus to increase your savings for a rainy day. He adds that you should ensure you have enough protection before you invest your bonus. Once these are covered, you may start thinking about investing. IPP's Mr Lam says: "Most people mistakenly believe that they may not have enough money to invest, but that is not true." You can build up a substantial nest egg just by investing one month's bonus consistently each year over the course of your working life, he adds. "It is important to note that there is no single formula that fits all. What works for others may not work for you. No one knows you better than your own self," says Mr Chris Gill, regional general manager of Friends Provident International. He advises people to understand their financial needs, risk appetites and how much they are prepared to lose. It is also useful to chart your saving or investment objectives and think about your preferred lifestyle. 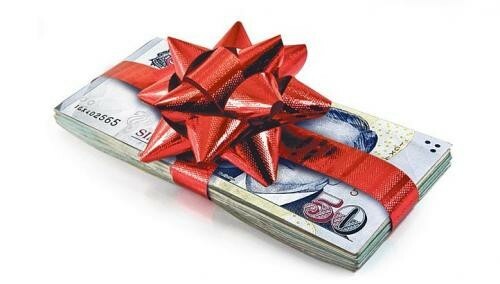 Your first bonus feels like a huge hongbao, but resist the urge to splurge. Young adults should consider reducing their student loans. Mr Lam of DBS says: "After you have addressed your key financial gaps, you can consider allocating a third of your remaining bonus to paying off an existing loan, especially if the interest on the loan is higher than the potential return on investment." Mr Peter Siong, senior vice-president, sales division, at NTUC Income, says: "With interest rates of student loans at around 5 per cent, this will help lighten their load considerably." Now is the time to review your insurance too, he adds, as those who are young are usually in good health and should take advantage of that to enjoy lower premiums and coverage without exclusions. You should look at getting basic protection for health, personal accident, total permanent disability and critical illness. IPP's Mr Lam says such families typically have higher household expenses compared with singles. Building cash reserves of three to six months' worth of household expenses is even more crucial in case the breadwinner has a major illness or loses his job. "Parents may like to set aside funds for future university expenses. This can be accomplished through investing in endowment plans or by setting up a regular savings plan," he says. The rest of the bonus can be set aside in a higher interest- paying account for near-term plans such as holidays or major purchases, suggests Mr Lam of DBS. "If you are planning to buy a home this year, you may wish to consider placing your funds in an account, such as POSB eMSA- Home, that will earn you higher interest on your savings when you take up a home loan with the bank subsequently," he adds. The eMSA-Home savings account offers a base interest of 0.25 per cent per annum on the account balance with monthly savings of between $500 and $2,000. Those in this category are likely to enjoy bigger bonuses, says Mr Siong, but their family commitments are also likely to be higher. "Bonuses are typically set aside for their children's higher education and other obligations such as taking care of aged parents." They should also be thinking about retirement. Mr Siong says: "If they have not already done so, they should allocate part of their bonus for their retirement, more if their spouse is not working." Mr Lam of DBS suggests a third of their bonus could go into investment or retirement planning, depending on age. "You can consider a diversified portfolio in fixed-income instruments and equities, but do speak with a financial adviser to better understand your financial objective, risk appetite as well as investment horizon," he adds. If you want to put surplus funds into investments, Mr Siong suggests "more secure and less volatile instruments such as blue-chip shares or funds that are of low to medium risk". NTUC Income has various savings plans for this group, such as RevoSave, which has flexible premium payments, and DreamSaver, which has a five-year premium payment term. On top of retirement planning, IPP's Mr Lam also suggests tax planning through the use of the Supplementary Retirement Scheme (SRS), which qualifies the investor for tax reductions. The amount of tax relief allowed under this scheme depends on the amount contributed to the SRS account, he explains. "When it comes to tax planning, many people tend to wait till the last minute and make their SRS contributions only at the end of the year," he says. "However, the end of the year is usually the time when expenditure is high and there is little left over to invest." Mr Gill notes that financial advisers can provide a second opinion, so consider speaking to one before committing to any saving or investment decision. He adds: "Please revisit your portfolio at least once a year especially when there are changes during the different stages of your life." Fund long-term goals and priorities such as university expenses; Pamper yourself or give to charity. He calls for prudence in dealing with one's bonus as it is not part of a recurring cash flow or revenue stream. "Bonus time is a time of general exuberance. Receiving a huge bonus may result in an individual feeling richer than he really is and may result in overspending. "A bonus should be regarded as a bonus, in its literal sense, meaning that it is something that one should not take for granted."